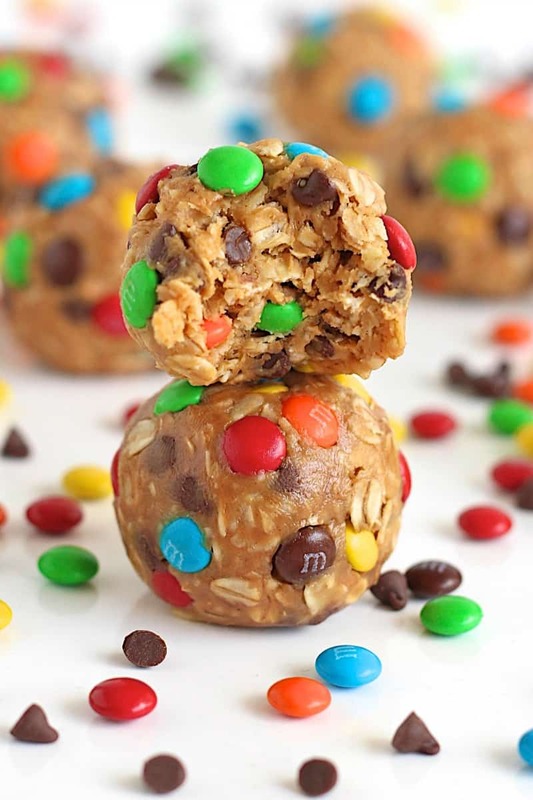 A sweet bite-sized treat that’s easy to make and tastes just like everyone’s favorite monster cookie! Wow! I just realized it’s been a month since I’ve posted. With the end of the school year, preparing for our trip to Asia, traveling for 2-1/2 weeks, and jet-lag getting the best of me for the past week, I guess I took a little unintentional break from the blog. I had planned to have all these recipes ready to post before, during and after our trip, but it just didn’t happen and that’s okay. Life happens sometimes and priorities take precedence. 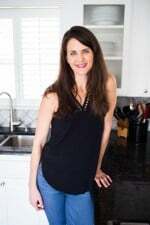 It’s felt great to have a little break, but now I’m ready to get back in the swing of things and share all these yummy recipes I have up my sleeve. 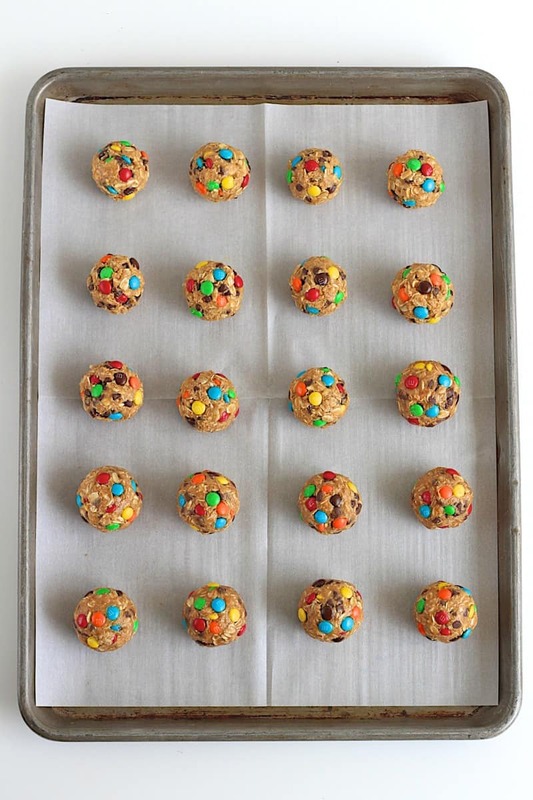 Like these monster cookie balls! They’re one of our favorite treats right now. The boys love helping me make them and of course, we all love eating them! We keep a container of these yummy little balls in the refrigerator for a quick treat any time of the day. We love eating them cold, especially in the heat of the summer, but you could certainly let them come to room temp and they’ll still hold their form just fine. They’ve got it all going on. Chewy, crunchy, sweet, a little salty and lots of little bits chocolate. So much yum! 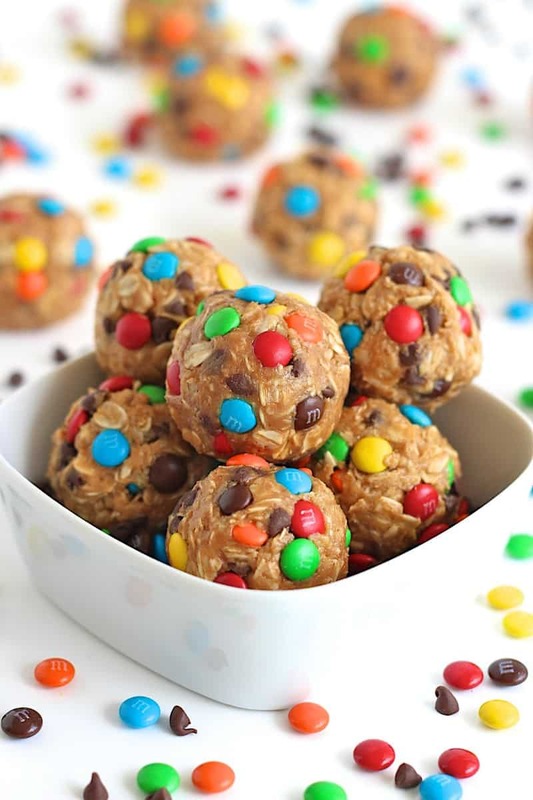 A sweet bite-sized treat that's easy to make and tastes just like everyone's favorite monster cookie! In a large bowl, stir together the oats, peanut butter, honey and vanilla until well combined. 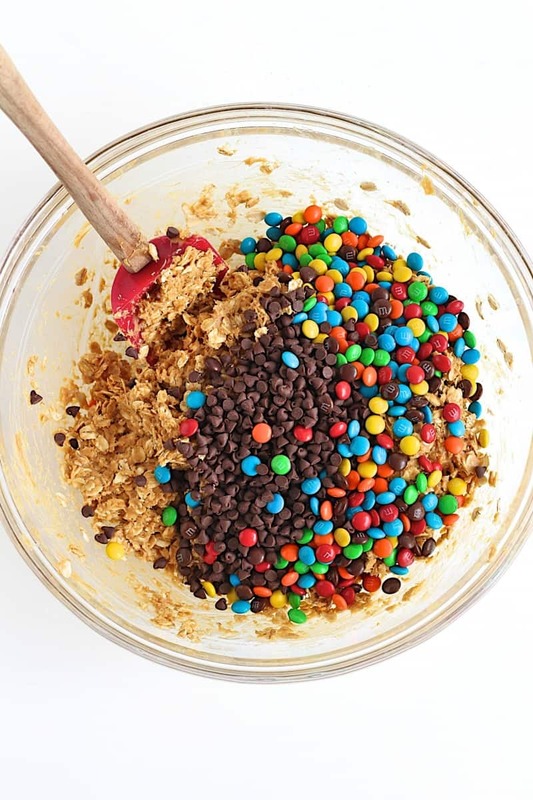 Stir in the chocolate chips and M&M candies. Roll dough into 2-tablespoon sized smooth balls and place on a parchment-lined baking sheet. Place in the refrigerator for 30 minutes or enjoy right away. Once the balls have set, transfer them to an air-tight container and store in the refrigerator for up to 2 weeks. We’ve got a peanut allergy over here. Think almond butter would work?? Or any other suggestion? Hi Ginny! Almond butter should definitely work. Enjoy! Maegan, I just loved following along on Instagram! That trip looked AH-MAZING!! I kept showing my hubby pics, and said, “See, they have little kids, and look at the trip of a life time they are taking! We can do that too! !” Seriously, that is so awesome how y’all took that time for yourselves! 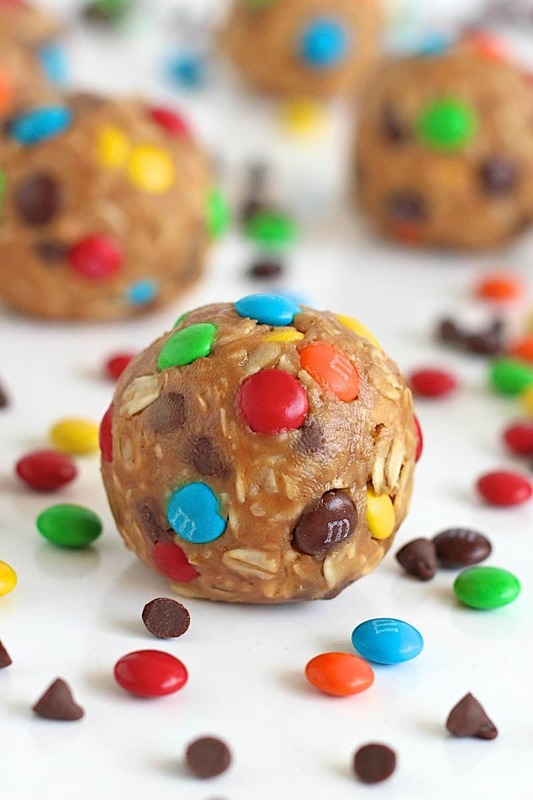 And these little cookie balls will be a beloved treat in my house!! Any tip on rolling these so that they don’t stick to your hands and fall apart? Love them just a bit messy to roll. Hi Tonia! That’s weird. The oil from the peanut butter or nut butter should coat your hands after rolling the first one so they don’t stick to your hands. You could try spraying your hands with non-stick cooking spray before rolling them to prevent them from sticking. Hope this helps. Enjoy! I have a legume (tree nuts and all beans) I use Sunbutted (sunflower seed butter) in place of peanut butter and it works just as good. Can get all types chunky and smooth. Sunbutter.com…..most grocery and health food stores carry just not all varieties. That’s great, Ronda! Thanks for sharing! These are great! It was so much fun making these with my son. We didn’t have mini m&ms so we used mini Reece’s pieces instead. Using a cookie scoop was an easy way to make a ballish shape without getting messy hands 🙂 thanks for a great recipe!! We just love these! Thank you so much! My question is, I was having a hard time while mixing them all together, they didn’t stick together very well. Do you have any suggestions to help them form easier. Hi Felicia! I love that you love them! That’s so weird they’re not sticking together well for you. Are you using peanut butter or an alternate butter? 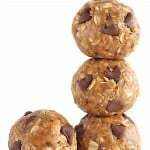 Maybe try adding a little more peanut butter until you can easily form the mixture into balls. Hope this helps! Can you provide the nutritional facts. I need protein, sugar amounts, carbs, fibers, calories. Hi Lisa! I don’t provide nutritional facts, but you can google “nutritional calculator” as there are several great calculators out there for you to calculate it yourself. Hope this helps. Enjoy! I came across this recipe on facebook and decided to give it a try. I only had peanut butter with honey and wasn’t sure if I should cut back the honey, but just followed the recipe. They turned out great! I have an idea that I’m going to try. 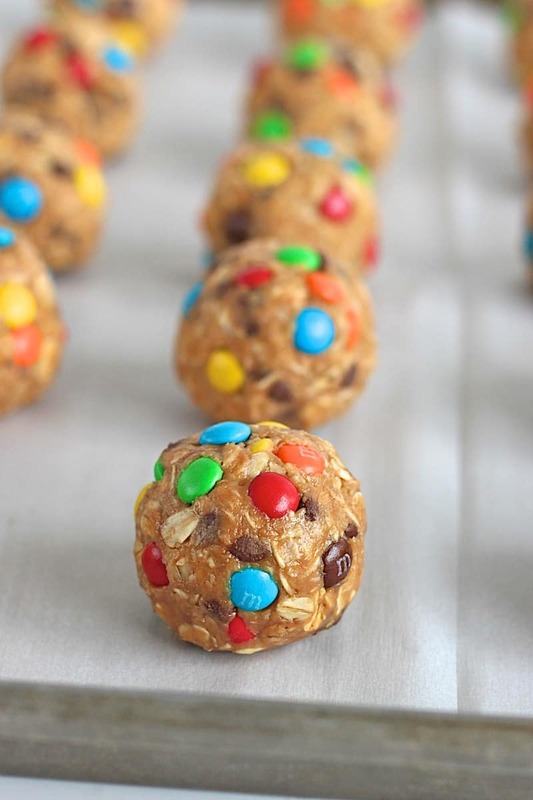 I’m going to make them with just the oats, honey, peanut butter, and vanilla. Then dip them into chocolate, sort of a variation on a peanut butter ball. Love that idea, Jana! Enjoy! Have you ever tried freezing these. I make many things in advance for my kids school lunches. Just curious! Thank you! Hi Desiree! Yes, they freeze great! Just freeze them first on the parchment lined baking sheet until frozen and then transfer to a freezer-safe container or baggie to store until ready to eat. Let thaw at room temperature for about 20 minutes or we even love to eat them frozen! Enjoy! Any thoughts on shipping these? I used quick cooking oats by accident will that ruin the recipe? Thanks! Hi Lauren! No, they should still taste great. They’ll just have a slightly different texture and taste compared to the old-fashioned oats. Enjoy! My kids absolutely love these for an after school snack! 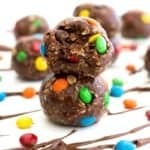 This is also an easy no-bake recipe that my older ones can make themselves! Hello! 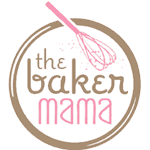 I am new to baking, and I was wondering that when it says vanilla, would vanilla extract work? 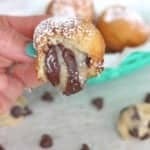 They look delicious and I’m planning to make them this weekend! My only doubt is whether to use all natural or regular peanut butter, which one do you suggest? Hi Daniela! I’ve made them with both and they turn great either way, but I usually use the no-stir natural peanut butter. Hope this helps. Enjoy! So, I just made these and I’m wondering how do you roll them without them sticking to your fingers? Do you dip your fingers into something? It is really hot and humid here in Michigan, so that may play into it a bit too, but just wondering if you have any tips! I have made this recipe probably 6-8 times in the last two months! It’s so easy and everyone loves them. Easy to take to barbecues and I’ve given them as part of neighborly thank you’s as well. A crowd pleaser for sure! And, they “keep” well because there isn’t really much that can go bad if left out in the counter etc. 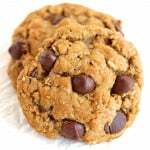 They are a good substitute for “regular cookies” also because they aren’t loaded with sugar. Love them! What is the calorie count for these balls? Hi Amanda! 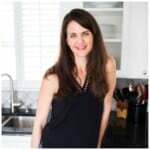 I don’t calculate nutritional values for the recipes on my blog, but you can easily plug the ingredients you use into an online nutrition calculator. Just google “free online nutrition calculator”. So just curious if I can bake these into cookies? Or are they just to be ate as is? Hi Holly! 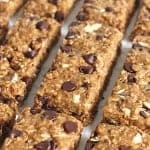 I’m not sure how they would hold together when baked as individual cookies, but I have pressed the mixture into a baking pan and baked them as bars and they turn out great! Just bake at 350 for about 15-20 minutes. Enjoy! Just wondering if you have an alternative for the peanut butter for those with allergies? Hi DEW! I suggest another nut butter such as almond butter, if you can eat it. Otherwise, sunflower seed butter or cookie butter would work great too. Enjoy! So, I don’t have any vanilla extract. Would that affect the taste or the outcome? Hi Chaylean! The vanilla is for added flavor, but they’ll still taste great without it. Enjoy! I find these really stick to my hands and alot gets wasted. Also once rolled they don’t hold well together. Maybe I am missing something? Hi Leeann! Oh goodness, that shouldn’t be the case. What kind of peanut butter are you using? Maybe if it has a lot of oil in it, try stirring it really really well. Or you could add more oats until it’s of the right consistency for rolling. Hope this helps! What kind of peanut butter do you suggests? Hi Leeann! I use the no-stir peanut butter. Usually, natural creamy. I’ve used several different brands to make these. I didn’t have good honey to use, so I subbed the 1/2 cup of honey for a 1/2 cup of sugar and added 1/4 cup of butter. Turned out great! My kids love love love these!! Thank you for the recipe!